Our range of lanyards are printed and assembled here in the UK, thus ensuring fair and ethical production. Unlike many British suppliers of lanyards, our full-time and longstanding workforce produce all our lanyards in our factory in Scotland, instead of sourcing cheap labour off-shore. This helps us to ensure that our products are of the quality and origin that you deserve. Because we print in-house we can also produce small runs of lanyards very quickly and cheaply. Custom lanyards are available from orders of 20 upwards. everything from custom lanyards with break-away connectors to printed lanyards used for corporate identity. We have a wide range of colours, materials and printing techniques, meaning we can produce exactly what you want. 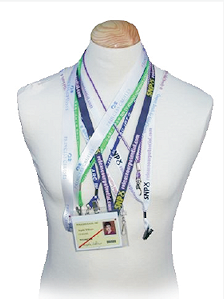 If you would like to get a quote for Lanyards click here.